Add to My Favorite Store. 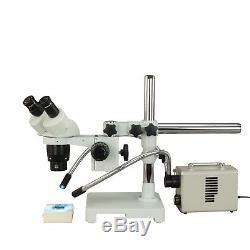 10X-20X-40X-80X Binocular Stereo Microscope on Single Bar Boom Stand with 20W LED Dual Gooseneck Fiber Light and 10MP USB Digital Microscope Camera. 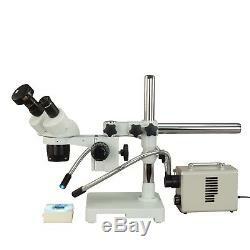 This is a single bar boom stand super widefield binocular stereo microscope with 10X, 20X, 40X, and 80X magnification settings combined with a 10MP USB digital microscope camera. It includes a pair of super widefield high-eyepoint WF10X/20 eyepieces coming with 45° inclined 30mm eyetubes with left eyetube diopter adjustment, a 0.5X auxiliary objective, a 2X auxiliary objective, a 20W LED dual gooseneck fiber light. The super widefield optics and high-eyepoint design ensure an easy and comfortable observation. 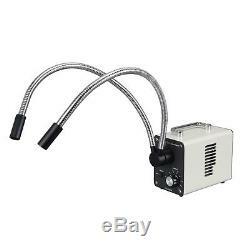 The included 20W LED dual gooseneck fiber light provides bright, cool, directed light onto the specimen and is intensity adjustable. The single-arm boom stand allows to turn the microscope head around two different axes, letting you point microscope head in various directions. 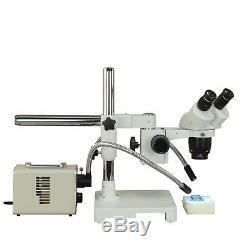 The microscope provides high resolution clear images, super widefield of view and large working distance. The digital camera captures still microscope images, streams live video preview to your computer, and is compatible with Windows, Mac OS X, and Linux (see version information below). Live video and still image capture can be set in different resolutions simultaneously. Binocular microscope paired with 10MP (3584x2748) USB microscope camera allows for use with a computer. 20W LED dual gooseneck fiber light provides bright, directed illumination onto the specimen. 10X, 20X, 40X and 80X four super widefield magnification settings. High quality optical glass elements produce sharp erect images. Sturdy metal framework with heavy boom stand base. Four magnification levels: 10X, 20X, 40X, 80X. Eyepieces: high eye-point, wide field WF10X/20. Objectives: rotational 2X & 4X. Sharp stereo erect images over a super wide field view. Left ocular-tube diopter adjustment ±5dp. Interpupillary distance: 2-3/16" 2-15/16"(5575mm). A uxiliary lens or ring light adapter mount: 48mm female thread. Auxiliary lens: 0.5X, 2X. 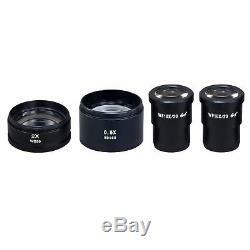 Working distance: 4" (100mm), 6-1/2" (165mm) with 0.5X auxiliary lens attached, 1-1/4 (30mm) with 2X auxiliary lens mounted. Field of view: up to 3/4 (20mm). Illumination: 20W LED dual gooseneck fiber light. Focus adjustment: metal rack and pinion, range 2 (50mm), tool-free tension adjustment. 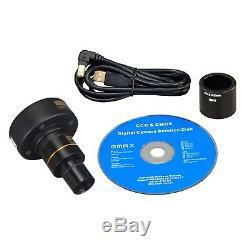 Digital microscope camera - True color 3584x2748 pixels (10M pixels) - 0.5X reduction lens to get larger field of view - 0.01 mm calibration slide: 1mm/100 division - Frame speed: 1.9fps at 3584x2748, 8fps at 1792x1374, 27fps at 896x684 - Software compatible with Windows, Mac OS X and Linux operating systems - Capturing microscope images, recording live video, measuring lengths, angles, areas, editing images - USB 2.0 cable included. Boom stand length: 22-7/8 (58cm). Boom vertical travel stroke: 7-1/2 (19cm). Base dimensions: 9" x 9" (23 cm x 23 cm). Please check the chart below for computer operating system compatibility. A pair of WF10X/20 eyepieces. A pair of rubber eyeshields. 20W LED power supply and control box. Y-type dual gooseneck fiber attachment. Digital camera - 10MP digital camera - 0.5X reduction lens - 0.01mm stage micrometer - 23.2mm - 30.0mm adapter - Software CD - USB cable. Fluorescent ring light for brighter even illumination. Gooseneck fiber cold light for flexible lighting angles. Fiber ring light with low heat and adjustable intensity. Other USB camera eyepiece for computer connection. A: We are happy to leave feedback for our customers once we have been paid and the item has been delivered to the carrier. We would appreciate that once you receive your item, you also leave us feedback. 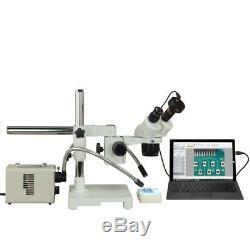 The item "Binocular 10X-20X-40X-80X 10MP USB Stereo Boom Microscope+20W Dual Fiber Light" is in sale since Wednesday, May 09, 2018. This item is in the category "Business & Industrial\Manufacturing & Metalworking\Semiconductor & PCB Equipment\Inspection Equipment".